A premier quality three bedroom timber lodge located on an award winning and immaculate site in this beautiful and historic town amidst the Cairngorms National Park. From the moment you step into this lodge the attention to detail and exceptional finish is evident from the luxury kitchen and bathrooms through to the atrium windows, vaulted ceilings and outside decking areas. The spacious lounge and kitchen with integral appliances and breakfast bar are on open plan and enjoy a magnificent vista across the Cairngorm Mountains and Cromdale hills, there are three double bedrooms (master with en-suite shower room and walk in wardrobe) an entrance hallway with utility area and built in storage in addition to a beautiful bathroom which can also be accessed from bedroom two. The lodge is highly insulated and benefits from gas fired central heating and is fully residential to allow year round living. Viewing is highly recommended to appreciate the quality of accommodation. The park is well renowned and has been the Scottish Regional Winner in the Practical Caravan and Practical Motorhome Top 100 Sites for 2018, the site is very spacious and always maintained in immaculate condition. The lodge is finished to a very high standard and includes amongst others solid wood frame and cladding, upgraded insulation, low energy lighting, dual flush sanitary ware, condensing high quality energy efficient boilers and soft close kitchen doors. There are smoke and carbon monoxide detectors, integrated fridge freezer, microwave, oven with gas hob. To keep your home cosy during those winter nights there is double glazing throughout, gas fired central heating with radiators in all rooms and outside security lighting. All furniture and items as viewed are included. The light and well proportioned entrance provides access to the lounge, kitchen / dining, bedroom two and the Jack and Jill bathroom and offers a range of modern light grey storage units with complementary workspace housing a Lamona stainless steel sink with mixer tap, a Zanussi washer / dryer and the Worcester combi boiler. There is a double sliding door cupboard providing fantastic storage for shoes and outerwear and there is a carbon monoxide alarm, smoke alarm, radiator, laminate flooring and ceiling lighting. A bright and luxurious lounge enjoying French doors and Atrium windows to the front allowing tremendous open views over to the Cromdale hills and providing access on to the beautiful decking area. 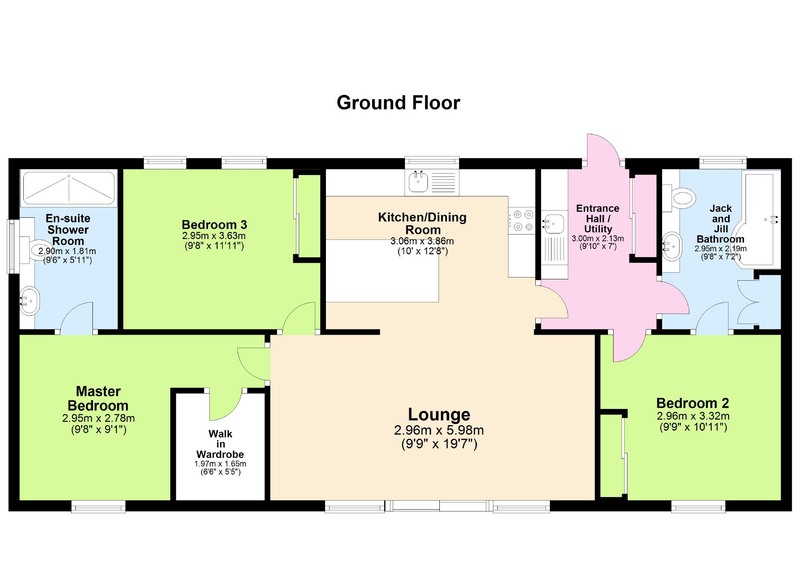 The lounge is open plan with the kitchen / dining creating a great place for the family to gather and spend time together. There are two radiators, two charming ceiling lights and carpet flooring. This spacious open plan kitchen / dining has a great range of modern soft close base, drawer and wall units with complementary grey work top and a matching breakfast bar with base units underneath which offers space for 6-8 people to dine together. Integrated within the kitchen is a stainless steel sink with mixer tap and integrated Zanussi appliances consisting of dishwasher, fridge / freezer, oven / grill, microwave and gas hob with stainless steel extractor hood over. Natural light floods through the window to the rear and a further Velux window mirrors this and offers extra light. There is an extractor, laminate flooring and recessed ceiling lighting. A welcoming and relaxing double en-suite bedroom which enjoys a window to the front allowing fabulous scenic views and benefitting from a spacious walk in wardrobe with carpet flooring and ceiling lighting, measuring 1.97m x 1.65m which offers fabulous shelving and hanging storage space. 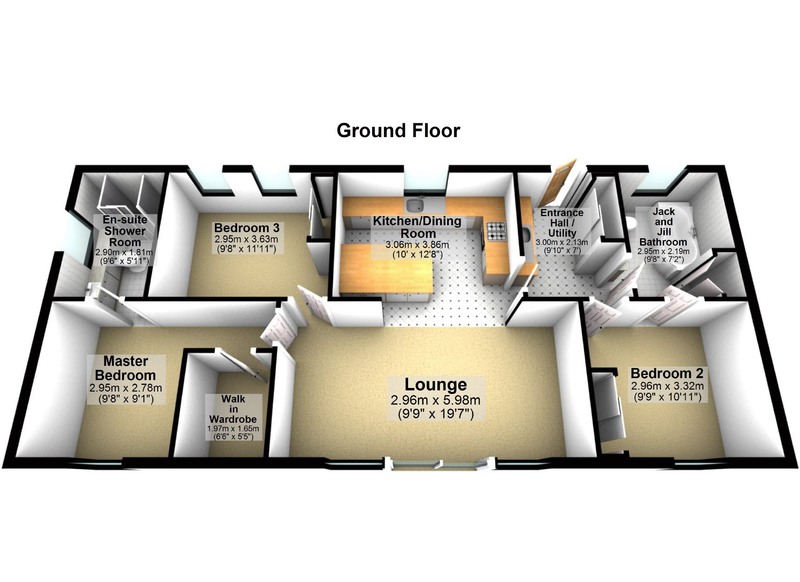 There is a radiator, wall and ceiling lighting and carpet flooring. A fresh contemporary en-suite comprising of a large walk in shower enclosure with modern tiling, housing a mains pressure shower, white vanity units with complementary grey worktop providing storage underneath housing a back to wall WC with chrome flush button and a Lecico wash hand basin with mixer tap and a mirrored unit with ambient lighting placed above. There is a chrome towel radiator, shaver point, extractor, vinyl flooring and ceiling lighting. A charming double bedroom enjoying a window to the front allowing fabulous views over the countryside and benefitting from a double sliding mirrored door wardrobe providing excellent storage. There is en-suite access to the bathroom and there is a radiator, carpet flooring, wall and ceiling lighting. A beautiful bathroom with contemporary white vanity units housing a modern Lecico wash hand basin with mixer tap, back to wall WC with chrome flush button and there is a large mirror unit with ambient lighting placed above. The P-shaped bath with twin taps houses a mains pressure shower and is surrounded by contemporary tiling and a modern glazed shower screen. Further storage is provided within a large shelved cupboard and there is an opaque window to the rear, chrome towel radiator, shaver socket, extractor, recessed ceiling lighting and vinyl flooring. The bathroom is accessible separately from the hallway and provides en-suite amenity with a lockable door to bedroom two. A bright and comfortable double room benefitting from twin windows and a velux window to the rear and enjoying an integral double wardrobe with mirrored sliding doors offering fantastic storage. There is a radiator, carpet flooring, ceiling and wall lighting. A large tarmac driveway leads to the side of the property and provides parking for several vehicles. A gravel area runs along the rear where decked steps lead up to the entrance. The lodge enjoys a marvellous large decking area at the side which extends along the front creating a beautiful place to relax and enjoy alfresco dining or sit with a glass of wine and appreciate the fabulous views. The current fees for 2019 are £138 per month and can be paid by monthly standing order. A lease with the site owner will be entered into by the incoming purchaser for the land and we are informed that this is in perpetuity as long as the lodge is maintained to the current standard and is governed under the terms and conditions of the mobile homes act 1983. We understand the lodge can be reassigned to the owners family if required. It is understood that the electric, water and drainage are provided by the site owner. There is gas fired central heating.